This year has witnessed numerous events hosted to commemorate the 500th anniversary of the accession of Henry VIII, including an exhibition hosted by the Royal Collection in Windsor Castle. This month sees the anniversary of another event of great importance for the history of St George’s Chapel: the 450th anniversary of Queen Elizabeth I’s promulgation of a new set of statutes for the Poor Knights of Windsor (SGC IV.A.7). These statutes, issued on 30 August 1559, expressed a new commitment from the Tudor monarchs to the community of Poor Knights, which had been underfunded and neglected since its inception in 1348. Elizabeth provided rules for a rejuvenated establishment, which would be better organised, financially secure, and hold a more prestigious status from that time onwards. The Poor or Alms Knights (known since 1833 as the Military Knights of Windsor), were founded in 1348 as an integral part of the College of St George, Windsor Castle, by letters patent of Edward III, confirmed by College statutes issued in 1352. These documents provided for the establishment of a community of twenty-six bedesmen who were required to be present in St George’s Chapel every day to pray for the Sovereign and the twenty five other Knights of the Order of the Garter. However, these plans did not come to fruition. There were never more than three Poor Knights in post at the same time before the mid-sixteenth century, largely resulting from the financial difficulties of the College in the Later Middle Ages. Henry VIII, who planned to be buried at St George’s Chapel, made provision in his will for what would essentially be a new foundation of Poor Knights. The new establishment was intended to exist as a symbol of the religious significance of the King’s place of burial; a new, prestigious, Anglican community, born out of the embryonic establishment of Poor Knights of the previous two centuries. Henry’s will of 1546 instructed that lands were to be granted to the Dean and Canons on the condition that they would maintain and house thirteen Poor Knights with a pay of 12 pence per day. These lands, known as the New Dotation, were granted to the College by Henry’s children, through Edward VI’s letters patent of 1547 and a warrant issued by Elizabeth I in May 1559. With the Dean and Canons of Windsor now in a position to support the Poor Knights financially, and with their new accommodation in the Lower Ward nearly completed, Elizabeth I formally issued the new statutes, which had been prepared during Mary’s reign. The statutes established rules for a community of thirteen Poor Knights, one of whom was to be chosen as a Governor and would lead the Knights and obey the commands of the Dean and Canons of Windsor. Candidates were to be chosen from men who had fallen into poverty after service in the wars or in other service to the Sovereign – any Knight who came to acquire an estate worth more than £20 per annum was to be dismissed. Candidates were required to remain unmarried, and the Knights were commanded not to ‘haunt the Town, the Ale-houses, the Taverns’, nor to ‘call any woman into their Lodgings, without it be upon a reasonable cause’. The Elizabethan statutes also contain provisions for a new uniform for the Poor Knights, consisting of ‘One Gown of four yards of the colour of Red, and a Mantle of Blue or Purple Cloth, of five yards’, with an embroidered Cross of St George without the Garter on the left shoulder. Account rolls held in the St George’s Chapel Archives show that these uniforms were being provided later in 1559 (SGC XV.49.31). The dress stipulated in the Elizabethan statutes was continued until 1883, only interrupted for a short period in the mid-seventeenth century when, under Cromwell, the Knights adopted grey gowns with the Arms of the Commonwealth. Without the renewed Tudor interest in the Poor Knights, the establishment founded by Edward III would surely have been fully abandoned. The promulgation of the Elizabethan statutes therefore represents a critical juncture in the history of the Knights of Windsor. The granting of new funds and the provision of new rules rescued them from the neglect and underfunding of the previous two centuries and provided a strong foundation for a community which has subsequently operated with the support of the Dean and Canons of Windsor and the Royal Family of Great Britain for 450 years. 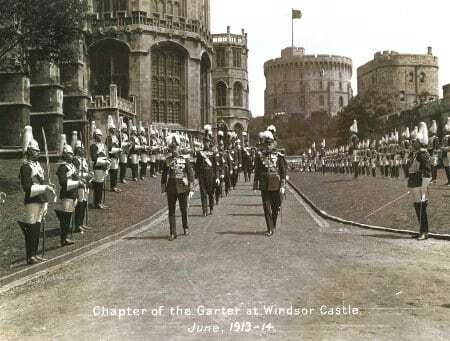 For more information regarding the history of the Military Knights of Windsor, and relevant documents in the St George’s Chapel Archives, click here to read our Research Guide for the Military Knights.